An interesting end to the week for spot price silver, not so much for what it did do, but rather what it didn’t, given the steep fall in gold prices, which surprisingly was not replicated for the industrial metal, which although closed the day lower, suffered a far less severe fall than that seen on the daily gold chart. 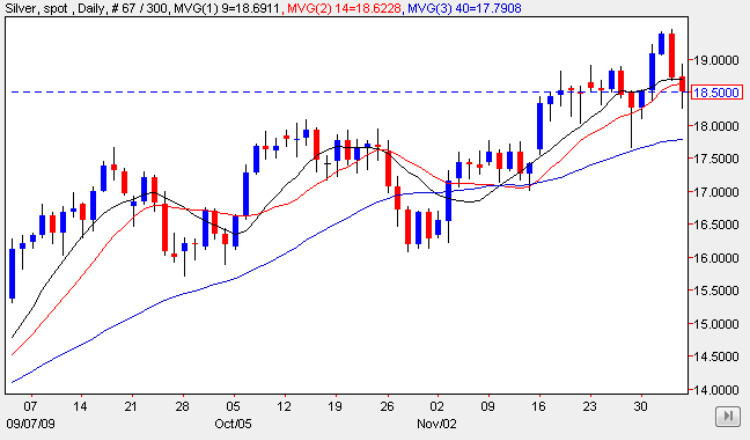 Indeed the daily candle on the silver chart almost closed as a doji, whilst gold prices closed with a very wide spread down bar which breached both the 9 and 14 day moving averages. So what are we to conclude from this odd price action which seems to suggest that the correlation between the two commodities has stalled once again. From a technical perspective the low of Friday seemed to find some support from the minor price congestion now immediately below in the 18.30 per ounce region, and given that silver failed to follow the sharp sell off seen in gold, it may be that the reversal of the last two days is simply a short term correction before silver prices continue to move higher in due course. With the 40 day moving average still remaining firmly supportive, the longer term outlook remains bullish for spot silver, and despite the sell off in gold, can expect to see a resumption in the bull trend in due course.